If you are a big coffee drinker, here’s a great deal on Starbucks brand K-cups from their online store. 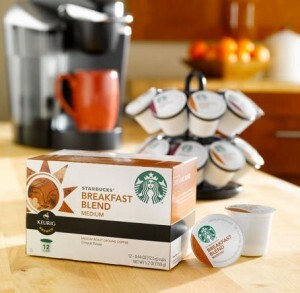 Through 10/21 you can use the coupon code RMNKCUPS for BOGO Starbucks K-Cups! To make things even sweeter, if this is your first order on StarbucksStore.com, you’ll get an additional 10% off with coupon code STNPWEKD. Shipping is a flat rate of $4.95 or FREE on $75+. Snag two 24 pk boxes of coffee for $19.95, use both coupon codes your total is $23.60. That makes each K-Cup 49¢, which is a great price from what I’ve seen. Since shipping is a flat rate, the more boxes you buy the cheaper it is per cup. Plus get 3.5% cash back when you shop through Ebates! Check out more Online Shopping!